Every so often these Danish modern chairs come up for sale or for free from an older relative or friend. Because these chairs can now be anywhere between 30 to 50 years old, they often need to be refreshed and repaired. Over time, the interior foam breaks down, the fabric wears out, and the wood can be cracked. Other unforeseen issues can come up, especially if you buy them online and only see them in a photo. These particular chairs that I found, had to have been in the house of a smoker. As you can see in the Before photo, you cannot see that the wood was covered in a thick residue of grime. When I went to pick them up, my reaction was- Yuck. But, I got them for a good deal. So with a little patience and perseverance, they ended up coming out quite nicely. 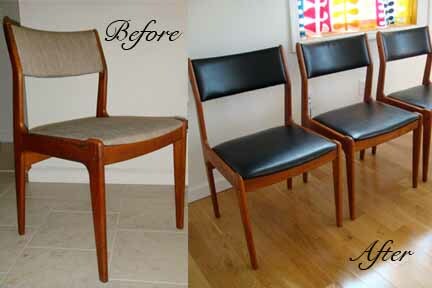 Below is a step by step guide on how to reupholster and repair Danish modern chairs. Please let me know if you have questions on any of the steps. Step 1- Assemble all materials and prepare a large enough area to work in. An area will be needed to clean the chairs and another area to lay out the fabric and foam. My studio has a ceramic tile floor. While it is not the prettiest, it allows me to get the floor wet and to then mop it up or vacuum easily. As you start to disassemble the chairs, you will have a mess as the old foam crumbles and the fabric starts to shed. If you don't have much room inside, a couple of these steps can be done outside, weather permitting. Step 2- Disassemble the chairs. Take photos or notes while you are disassembling. Everyone always thinks they will remember how they took something apart, but they never do! It will make your life a lot easier if you document your process. With these chairs, you need to remove the wooden buttons to get to the screws that hold the chair together. The buttons will pop out if you place a Scribe tool in the corner and pry them out. Sometimes, you will have to sacrifice one that splits. They can also be repaired with glue, as they are just cosmetic. Put all your screws, buttons, and parts together with each chair. Label each chair and each part to that chair. This is very important. Wood can get tired and cranky when its old. Most likely you will not be able to interchange parts from different chairs and you will be just as tired and cranky if you have to try to make them fit. Step 3- Clean the teak wood. Depending on the condition of the chairs you are working with, you may be able to skip this step. As I mentioned, the chairs I was working with had a layer of grime on them from cigarettes. I could run my thumb nail along the surface and scrape a black coat of filth off. Gross. Using hot water with a bit of Murphy's Oil, scrub the chairs with Scotchbrite. Change the water often. If you can get away with only using a rag, try to. It took a long time to remove all the dirt. Allow the chairs to thoroughly dry. Step 4- Examine the wood for any cracks, splits, and damage. If the chairs are perfect, skip this step. Because teak is an oily wood, regular wood glue will not work for repairs. Gorilla Glue will need to be used. One of the chairs had a split on the side member. I dampened the wood and shoved the Gorilla Glue into the split. I then clamped two scrap pieces of wood on each side to hold the repaired piece in shape. I let it sit overnight for the best results. When taking the assembly apart, carefully use a chisel to scrape any glue that has oozed out of the crack and onto the surface. Step 5- Sand the entire surface of the chairs with 220 sandpaper. Teak wood can dry out overtime and needs to have oil reapplied. Sanding the surface will ensure that there is no residue or foreign material on the wood. By creating an even surface, the oil will absorb nicely. Step 6- Apply the Danish Oil or Teak Oil. Using a clean dry rag, follow the instructions on the back of the Watco Danish Oil can. I like to use the Danish Oil Natural, but feel free to use the Teak Oil. There isn't much of a difference between the two types. Between coats, let the wood dry overnight. Before applying the next coat, rub the entire surface with superfine steel wool. Put 2 to 3 coats of oil on the wood. After final coat, rub entire surface with superfine steel wool. It will bring up a nice shine to the finish and make the wood sing. Place wood frames to the side. Step 7- Remove old reupholstery. Take the seats and remove the staples from under the chair with a screwdriver. As seen in this photo, I put newspaper over my table. When taking the old upholstery off, a lot of it just crumbles and falls apart. When I'm done, I can gather up the paper with all the debris and throw it away. Follow the same method with the backs. Often when I reupholster, I will find out that I am not the first person to redo the piece. It can become a mini excavation. Based on the different layers and fabrics, you can figure out the approximate time someone did a reupholstery. It's interesting to see the history of a piece. Once all the fabric and foam is removed, use the chisel to scrape any remaining foam that may be stuck to the wood. Step 8- Apply foam to seat and back. Carefully layout the seat and back parts on the foam. Cut the foam to size. Do this outside or in a well ventilated space.- Spray Super 77 onto the wood and the matching side of the foam. Place the foam on the wood and work the two materials together. Super 77 is sneaky to work with. Try to keep from getting any on your hands, or you will be amazed how everything that becomes stuck to you- lint, dirt, foam, your dog, etc. Let the Super 77 dry according to the directions on the can. Step 9- Carefully layout the seat and back parts on the fabric. I used black vinyl because I find it to be era correct and desirable to the market. I chose a more expensive vinyl that looked fancier and was a better quality to work with. Vinyl, in general, is hard to work with because it is stiff. To make the process easier, choose a fabric without a repeating pattern. Also cut out the pieces of black fabric for the underside of the seat. It is a nice finishing detail. Step 10- Attach the fabric to the seat and back. This will be the hardest step in the whole process. Use a staple gun with the appropriate staple length. I use an electric staple gun because it is hard to have the strength to staple through all the layers manually. For the seat, start in the center of one side, secure your fabric in place and begin to staple around the perimeter, pulling the fabric tightly. Unless you have meaty hands, your fingers will be sore from this. Staple the corners last and try to work the fabric over the corners smoothly. Applying the black fabric after will create a nice finish detail and make the underside of the chair disappear. For the back, start by stapling on the bottom edge. Wrap the fabric over the front to the back and fold the edge. Place the folded edge on the bottom and staple to secure. Then, wrap the sides and staple the sides cleanly. Unfortunately, I forgot to take photos of the back assembly. So, let me know if there are any questions. Sometimes the staples will not seat all the way down when stapling. Use the hammer to nail them fully in. Step 11- Reassemble the chairs. Using your notes or photos, labeled screws and wooden buttons, put the chairs back together. Apply felt feet. Step 12- Fini! Stand back and admire your work. These Danish modern chairs, which have no official name that I am aware of, are really great. They have survived the test of time because the design is well thought out. It has minimal pieces and assembles easily with screws. Teak is a durable wood. The proportions are perfect. Whether you are small or large, you will fit comfortably in them. They also do not take up a lot of room and they are fairly easy to find. Amazing post! Your step by step directions are terrific. It makes me want to scour the internet to find my own set of these lovely chairs. and your post gave me the courage to take them on. I just took the first one apart and it took me forever to get all the thousands of staples out one by one and all the crumbly foam off. Any tips on how to speed this part up? Also, did you use the same thickness foam on the back as on the seat? It seems the seat foam is much thicker. Removing the staples is time consuming. To speed the process up, I put on some good music! Then, I grab a flat head screw driver and hammer. I go around and place the flat head a little under each staple, and hammer the handle to push the head under the staple to pop it up. I go around a do this to all staples to loosen them up. I then grab pliers and go around and pull each staple out. To remove the foam faster, take a 2" scraper with handle and scrape the foam off. Since its so old, it should come right off. As for the foam thickness, I use the same on the seat and back. It is a personal preference. When fabric is stretched over foam in a large area, the foam has room to expand beneath it. When fabric is stretched over foam in a tight area like a seat back, the foam becomes more compressed which will make it look thinner. Good luck on your project and share photos when you are done! Hi. Great, specific information here! I picked up a set of Teak Danish Modern chairs, and am having trouble with the staples. The curved wood seat bottom looks identical to the one you used. I'm not sure what type of wood it is, but it is very hard!! I wonder if the seat base is also teak? Well, I cannot for the life of me get the staples to go in straight. I have tried various length staples. I noticed that the ones I pulled out of the seat were quite thin. Mine are thicker, but the same length as the original. I have tried a traditional staple gun, and an electric gun (not an air gun). Any tips on the length or thickness of staple that works best? Did you use a special upholstery staple gun? Tips on where to find the best staples? Thanks! Thank you for the post. recently bought a table and 6 of these chairs for my daughter. I am finally getting around to recovering them. Like yours, mine had been recovered once before( with a horrible pastel jacquard ala Miami Vice)over the original natural woven fabric. I'm using a Swedish modern fabric from IKEA. It's not as thick as a vinyl or Naugahyde, but I am still having trouble with the seat backs. I am wondering what type of stapler you used? My hand and electric models will not staple down in the groove so I was thinking of renting a pneumatic one. Do you think a long nose one will work better than a standard one? Thanks again for the great instructions. I'll send some photos of the finished product when I'm done. Amazing post I really like the style of the chairs it seems like the post of lounge chair repair nyc. Keep it up! Hi, I know you did this project a few years ago, but I was wondering if you could re-post and provide some info on how you learned (and actually did) re-upholster the chair back. I have found one Youtube video, and unfortunately, it doesn't show much detail on how to attach the fabric to the chair back without showing the staples. Thanks! Hi. Does anyone know where to buy the pins that the chair seat rests on? The one with screw hole that you screw into the bottom of the seat? Amazing post! Your step by step directions are terrific. Now, I don’t need to go to for my chair repairing to anyone. Your post will help me to repair my chair by myself. Amazing post! Your step by step directions are terrific. Now I don’t need any chair repairer I can repair my chairs by myself even I can also help to others. I have just gotten my chairs repaired, but they did not put on the right buttons and broke quite a few in the process. Can anyone tell me where I can get wooden buttons that fit? A great step by step photo instruction! I can't wait to give upholstery a try. They told me that it could be a nice way to put your effort into. In order to make this nice upholstery what you need is a lot of effort to work. I just found some of these chairs and your post gave me the courage to take them on. Thanks for the great articles and resources. This post is terrific! I have a set of four chairs exactly like the set you repaired, and I've been planning to reupholster them for ages. I'm glad to find your instructions and tips for what worked. Recently, I found two danish chairs in the dump (one with armrest and other without it) and I decided to rescue them. They are exactly like yours and I felt excited when looking into Internet found your post. The only problem is that my chairs lost the seats and I do not know how repair them. I wander if you could help me realize how the seats are assembled to the chair in the down side of them. It would be great if you had a picture of it. How To Reupholster and Repair Danish Modern Chairs? Nice blog it is very help full to Reupholster and Repair Danish Modern Chairs. Excellent information, thank you. You did a nice job. I have a can of Danish oil, so I'm ready to get started. Thanks again! We got six chairs and we upholstered them, which looks great today, however, I am in need of finding plug (button) replacements. Do you know where I can find them?? Please reply, thanks! Some pictures or more details on how to do the chair back would be great. I can find lots of sites describing how to recover the chair seat, but nothing on the backs, which looks to be trickier to me. I have these exact chairs and can't see any staples on the backs! Thanks! Thank you so, so much for this step by step guide! I'm looking forward to giving it a go with my chairs. That's really very nice blog. Good job and great efforts. Keep it up. Excellent information, thank you. You did a nice job.